12, August 2016: Airwheel C5 is equipped with a camera which offers a function of selfie. For many contemporary people, the selfie is the most popular form of photography. It is used not only for recording the beautiful record but also acts as a social tool. The introduction of selfie is a massive success, which allures a lot of customers and the young in particular. 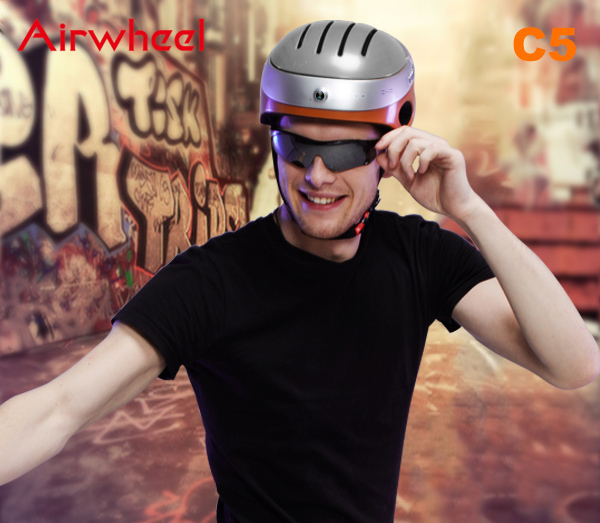 It is over 3 months since Airwheel released its first wearable equipment C5. Currently, a vogue for the wearable equipment appears in the market for electronics. Any electronics firm is bent on entering this field and making a big splash. So is Airwheel. Airwheel has become a worldwide famous scooter-maker. To begin with entry into the field of the wearable equipment, Airwheel developed the smart helmet C5. The advent of Airwheel C5 came as a surprise to all customers of Airwheel. They were taken aback by it because of its purposes and functions. Airwheel intelligent helmet C5 is a sophisticated device that integrates the recreational purpose into the practical function. When it comes to the practical function, everyone will think its basic usage is to protect the rider from getting hurt during the ride. Indeed, Airwheel C5 serves a safety protection and effectively shields the rider from falling off. This helps some beginners restore their confidence. In turn, it expands the business of Airwheel and wins over more potential customers. The recreational is main draw of Airwheel C5 helmet heads up display. Airwheel C5 is equipped with a camera which offers a function of selfie. For many contemporary people, the selfie is the most popular form of photography. It is used not only for recording the beautiful record but also acts as a social tool. The introduction of selfie is a massive success, which allures a lot of customers and the young in particular. In addition to the selfie function, Airwheel C5 Bluetooth helmet has the ability to play music. When the rider steers Airwheel electric self-balancing scooter, it must be a treat to listen to the music, wearing Airwheel C5. The music is transmitted by the Bluetooth. The Bluetooth enables the rider to answer a call without taking out his mobile phone from his pocket. The vogue for Airwheel C5 willlast for a long time. This is just a beginning of Airwheel on the path of the wearable equipment.